Ergonomics deals with the interaction between physical and physiological aspects of the human body with the man-made products and design. Proper ergonomics makes you comfortable to work with objects according to the principles of the human body. This helps in avoiding injuries and makes you more productive. Typing ergonomics deals with physical ergonomics. It is the science of your interaction with a computer keyboard (also called the ergonomics of keyboarding) . When working with a keyboard, or a mouse, or any other computer accessories, there should be a complete fit between you and these accessories. This means that you should be completely comfortable when working and should not be stressing/straining any part of your body. Lack of this balance can cause work-related injury. Our body, just like any machine, if overused can break down. This is why it is important to know about the right way to work when using a keyboard or any other typing related accessory. Knowing the proper way of typing while working will help us take care of our body in a proper manner without abusing and injuring it. It helps us understand what is the ideal method we should be following. Prolonged typing can put repeated pressure on fingers, knuckles, wrists, hand and arms, shoulders and back. And if this goes unchecked, it could lead to an injury. The static posture of the body while typing for hours together can also lead to injury. The same thing happens when we use awkward postures (slouching, the wrong position of wrist/elbows, wrong placement of the screen or keyboard etc.) while working and typing. The key to proper typing ergonomics is the right position of your computer and all the associated accessories. Along with it, frequent breaks and exercises will help avoid injuries to the musculoskeletal system while working. Injuries associated with typing include carpal tunnel syndrome, De Quervain syndrome, tendinitis, epicondylitis, trigger finger, focal hand dystonia, ulnar tunnel syndrome, radial tunnel syndrome, sprain, and strain etc. Now let’s cover a few simple typing ergonomics tips that will help you be more productive and also avoid any work-related injury. A wrong sitting posture can result in pain in your back, arms, shoulder, and hands. The ideal sitting position should be straight with a slight recline with back on back support. This opens up the blood circulation. Forearms should be parallel to the floor with your feet resting on the floor or on a footrest. This will ensure good stability and support. Knees should be bent at 90 degrees. There should be sufficient space between the edge of the seat and back of the knees for good blood circulation. Thighs should be parallel to the floor. Lower back can be supported with a rolled up towel. If your work involves sitting for long hours, you should consider investing in a good ergonomic office chair or a kneeling chair. These chairs are designed to keep your body in a better posture and put less strain on your body. Place yourself one arm’s length away from your laptop/desktop monitor. You should always adjust the seat height so that your gaze should fall just below the upper edge of the screen. If needed, use a stand to raise the monitor screen to this level. Make sure you’re comfortable while typing and can look straight without looking up or down. Monitor too high or low will cause neck strain. Another important thing to keep in mind when working with monitors is the lighting. Keep glare away by adjusting the lightings and draping curtain and using anti-glare shields. Also adjust the brightness, contrast of the screen. This will make sure you’re not putting any unnecessary strain on your eyes. According to a Cornell University project, an ideal typing position with respect to the keyboard is a negative tilt keyboard. In this position, the keyboard should be below the elbow height and keyboard base placed away in a negative tilt so that keys are accessible to the fingers in a neutral position of the wrist and hands. This position also ensures good circulation. Use an attached stand which can be fixed below the desk to place the keyboard in this position. Below is an image of an ideal typing position when working with a keyboard. Do not pound on keys but keep light pressure. If possible, use a speech to text typing software to give rest to hands. An ergonomic keyboard is a good option to invest in as it will relax the muscles of the hands, arms, shoulders, and neck. Try split or angled keyboard. When working with a keyboard, your forearms should be horizontal to the keyboard. The keyboard should be easily accessible while sitting without having to reach. A good position of hands is either parallel or slightly below the elbow. The finger should rest on the second row of keyboard letters. Starting from pinky finger resting on A, next on S, next finger on D and index finger on F.
The left side index finger should rest on J the next on K, then L and the pinky finger should rest on semicolon. Thumbs of both hands should rest on the space bar. The movement of fingers would be on vertical columns and sloping towards the left. Both the index fingers are responsible for an additional middle column of the keyboard. Below is an image that shows the optimal way to use the keys on the keyboard. The left-hand pinky is responsible for all the keys on the left side and the right-hand pinky is used for all the keys on the right. Keep fingernails short for a smooth typing experience. Don’t rest wrists on the keyboard, you can rest palms on a palm rest. It is better to keep wrists above the keyboard. You can also consider investing in an ergonomic mouse pad, which usually comes with a place to rest the wrist. Keep your workstation clutter free. Keep things of immediate like document holder etc nearby to avoid reaching for it. The desk should be clean and sturdy for good efficiency. Place all things of immediate use close by in a semicircle pattern. Keep sufficient space between desk and chair for free movement of legs. Avoid reaching out for the mouse by keeping it close by. Also, keep the mouse it on a flat surface and make sure your wrists are straight when working with a mouse. Use a good ergonomic mouse for work to keep hands in the neutral position. 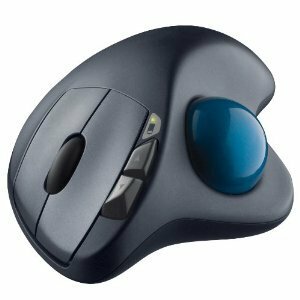 Many ergonomic shapes are available at the market (but I personally swear by the Logitech M570 mouse with a trackball). Keep a lot of free space for moving the mouse (if not using the one with a trackball). Your whole hand should move instead of just wrist movement to avoid injury. Related: Here is an article on how to setup your ergonomic workstation. Stretching and exercise done daily keeps the body healthy. It reduces stress and strain on your body and helps in good circulation of oxygen and blood. It repairs and rejuvenates the body and relaxes the mind. EYES: Blink often. Keep eye closed tightly and then open them. Repeat. After every 20 mins look away at a distance of 20 ft for 20 seconds. It’s called 20-20-20 rule. Download and print out an eye relaxing pictures of forest or greenery (picture has to be green). Stare at it for a while. KNUCKLES: Spread fingers wide. Bend fingers at knuckles, hold for 10 seconds, relax. WRISTS: Rotate wrists clockwise and then rotate it anticlockwise. Straighten arms in front, interlace fingers palm outwards and stretch. HANDS: Clutch a round shaped object, tighten fingers around it. Hold for 10 seconds, relax. You can also use a squeeze ball to keep your hands and wrist active and strong. FINGERS: Place hands on a flat surface and raise your fingers upwards. Now take the other hand and try to pull these fingers towards the wrist. Hold for few seconds to stretch fingers then release. Make sure you don’t pull aggressively. FOREARMS: Place hand palm to palm. Keeping elbows even, rotate palm till they turn downwards. Hold for 10 seconds. ARMS & BACK: Place an arm on the back and try reaching shoulder blade. Take the other hand over the head and try meeting the hand of the other arm. SHOULDERS & ARMS: Spread arms apart on the side and make slow circles forwards and then backward. NECK: Turn your neck to one side. Hold for 10 seconds. Turn to another side. Tilt your head on one side. Hold for 10 seconds then repeat with another side. No matter how ergonomic your posture is and how apt your machine structure and position is with respect to the body, there are still chances of injury. To avoid them one needs to take frequent pauses and breaks. This helps to combat the negative effects and diminish the causes leading to injury. Arrange your schedule so that you manage to take breaks without compromising work efficiency. Take frequent micro pauses of 20 seconds to 2 mins in which you do a different activity, however small, using a different set of muscles. You can take a short walk, stand up and stretch yourself, move around a bit and then come back to your seat. These small breaks are extremely effective in making sure you are not continuously straining your body. These short breaks allow a window to your body to relax the muscles. Drink lots of water to keep yourself hydrated and for a good blood circulation. Keep alarms for drinking water (you can find tons on apps for this). It will help you avoid back injury as discs at the back require a good amount of water. It will also make you use the washroom frequently as a mini break. Increase the oxygen supply to your body by alternating between sitting and standing. Walk around for 5 mins every half an hour. Stretch your muscles for 5-10 mins every hour or two. Do any of the recommended exercises (covered above). By following these seven typing ergonomic tips, one will be able to avoid injuries while working. It will increase your productivity and efficiency. You can work without your body rebelling in form of aches and pains. It will also increase your speed and output. That will give you an edge over others. Once a comfort level is achieved, performance automatically improves. It will cause you to become sick less often leading to stable employment. This will improve your financial security. Common Computer Injuries and How to Avoid These.